Too often we focus on the angry, reactionary minority. But, Huntley shows, there is also a large progressive centre. For some time, a clear majority have been saying they want action - on climate and energy, on housing and inequality, on corporate donations and the corruption of democracy. Would a Shorten Labor government rise to this challenge? What can be learnt from the failures of past governments? Was marriage equality just the beginning? 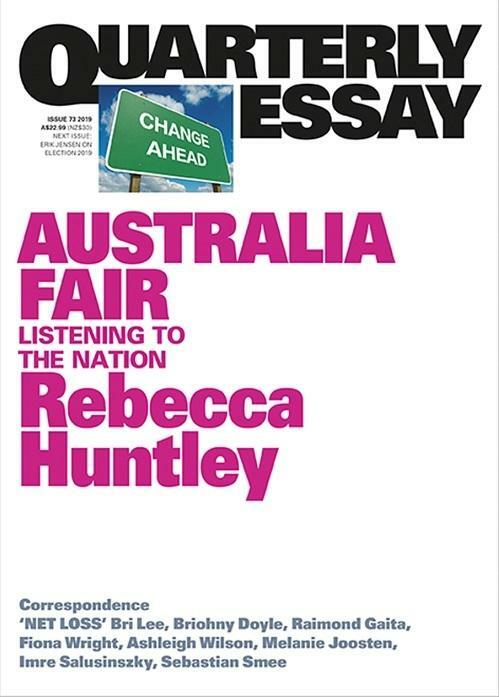 In Australia Fair, Rebecca Huntley reveals the state of the nation and makes the case for democratic renewal - should the next government heed the call. Rebecca Huntley is one of Australia’s leading social researchers. From 2006 until 2015, she was the director of the Mind & Mood Report, Australia’s longest-running social trends report. She is now head of Vox Populi research. Her most recent book is Still Lucky. She presents The History Listen on ABC Radio National.